KATHMANDU, Oct 27: Fairfield by Marriott, Marriott International’s second largest brand, is celebrating its 30th anniversary year by honoring the brand’s heritage that was born at the Fairfield Farm, unveiling a new brand design and launching a global social responsibility initiative to expand upon its relationship with Habitat for Humanity by launching a national partnership. 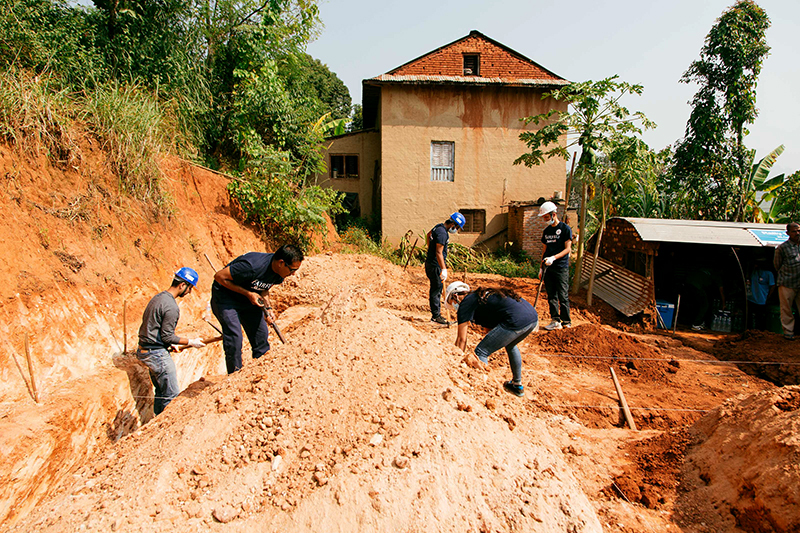 Yesterday on October 26, hotel associates from Fairfield by Marriott Kathmandu and members of the international press worked alongside Habitat for Humanity Nepal in building a home for a local family in Kavre, Nepal – an area that was affected by the 2015 earthquake, situated 32 kilometers outside of the capital city. Fairfield by Marriott Kathmandu joined Fairfield hotel teams around the world in celebrating the brand’s 30th anniversary as part of the “Rally to Serve” initiative. Fairfield by Marriott, one of the hospitality industry’s fastest-growing brands with nearly 900 locations worldwide, first took root at the Fairfield Farm – a Hume, Virginia, United States ranch purchased by J.W. and Alice Marriott in 1951. Fairfield Farm, nestled amongst the Blue Ridge Mountains and the Rappahannock River, served as a retreat from the everyday chaos where the Marriott family perfected their art of hosting – they hosted friends, business associates, and dignitaries alike (including U.S. presidents Eisenhower and Reagan) – and seeded the inspiration for the brand’s founding in 1987. Like its namesake, the brand was founded to provide a calm and seamless stay for all types of travelers. Soon, a legacy of trusted service and family treatment was established, along with the Fairfield 100% Guarantee service philosophy, which is proudly upheld by the brand’s more than 3,000 associates worldwide today. Farm-to-Hotel – Fairfield Debuts New Brand Design: Paying homage to the brand’s origins at the Fairfield Farm, Fairfield is introducing a new brand design. The new décor package is warm, timeless, forward-thinking, and inviting with simple nods back to the brand’s heritage. Specific elements meant to evoke feelings from the Fairfield Farm include a farmhouse table in the lobby for gathering and connecting, photography from the Fairfield Farm serving as artwork in the lobby and guest rooms, natural materials and unique textures featured throughout, and a history wall in every property showcasing the brand’s roots. The new design launches this November and will be on display in properties this fall, like one of the brand’s newest properties, opening outside of Boston this November. Continuing to Serve the Community: Fairfield will expand its support of Habitat for Humanity by launching a national partnership with a global build campaign to honor the brand’s 30-year history and look forward to its future. The global build campaign will span five countries throughout the month, bringing together Fairfield associates with local Habitat organizations to work alongside future and current homeowners to help them build or improve the place they call home. 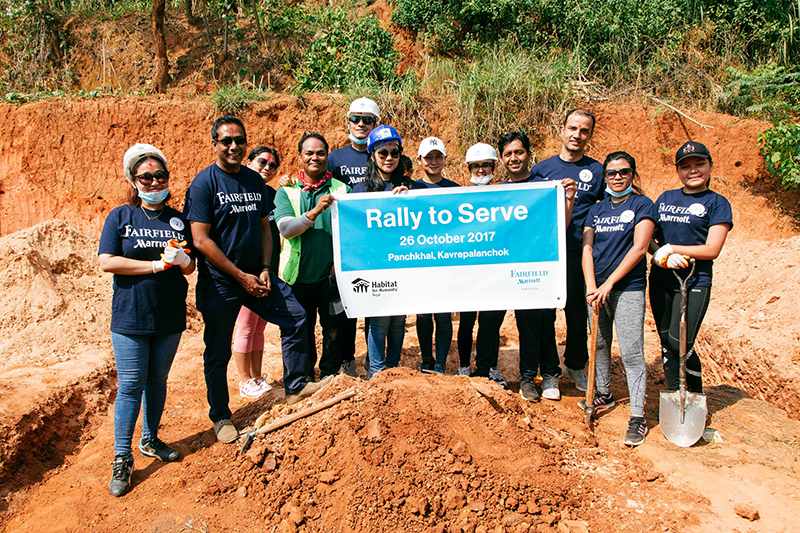 With builds from New York City to Nepal, one of Fairfield’s newest markets, this campaign will be the largest “Rally to Serve” day in Fairfield’s 30-year history, encouraging associates around the world to give back to their communities.